Wounded Frodo’s first sight of Arwen is in an almost angelic in a soft focus scene where she wear a silver white dress and is surrounded by light. 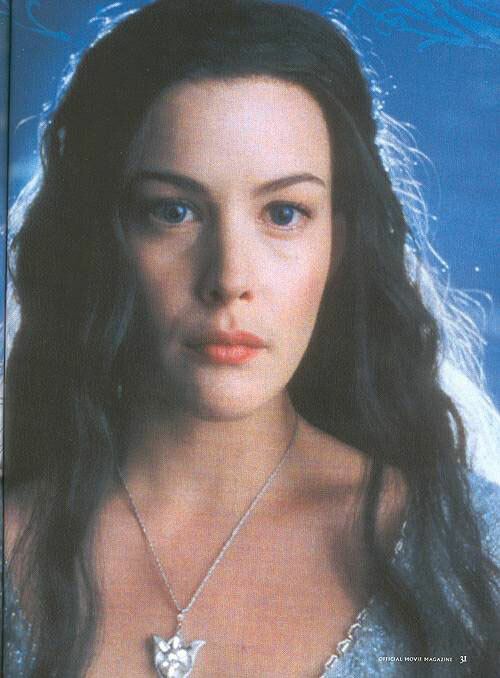 Arwen implores Frodo “to come back to the light”. Very little of the dress is seen because the scene goes by so quickly. The scene is lit to give it an angelic, surrealistic quality. She rides towards the camera, the fabric flowing behind her. The lighting causes her to almost join with the horse, an angel arriving. She dismounts in a flow of fabric. Then she is moving forward and we see her as she reaches out a reach out towards the camera, an angelic vision in white. There are two dresses used in this scene. She rides up in the "Halo Cloak" and original dress. 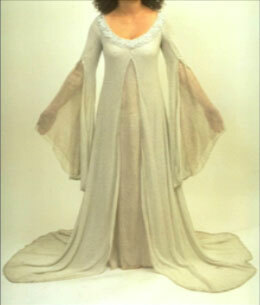 In re-shoots, she wears the scoop necked "Angel Dress" that we are more familiar with to approach Frodo. From early magazine articles... the reason she is so obscured with light at the beginning is that the stunk woman was dressed in the wrong dress and hairstyle for this scene and it was not caught... so special effects blended and whitened the whole scene. This has since been disproved. From the SE DVD commentary... The original dress was of wool woven with metal, with a terrific drape to it, an unusual find, as were many of the elven clothes. The Cape she wears was crocheted and hooded, and also of wool and metal crocheted together into a fabric. This gave the 'halo' effect. 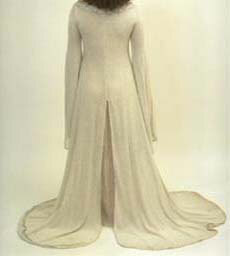 However, when they filmed her sitting beside Frodo it all got too heavy and clumpy, so they scrapped that part and made the 'Angel dress' we are familiarly with instead, with a crossover, not unintentionally, but because they liked the 'Halo Cloak' for the dismount, The new dress was more "heavily beaded with gems and jewels", and they didn't use the cloak for that part of the scene. Outer dress closed below the bottom of the breast Outer dress closed only until just below the center breast line. Under dress sleeves have a wide bell Narow sleeves for the underdress, not any wider than the Chase Dress. Both layers suitable for riding astride. Underlayer, blousy palazzo trousers (open at the bottom), wide enough to be mistaken for a skirt Only outer layer appears suitable for being astride a horse. This wonderful cloak is what gives this outfit it's name, even if it should more correctly be called a shawl since there is no neckline. It is just a large triangle. It is made from a very soft long hair fiber that almost looks like long haired angora mixed with metallic fibers. The fabric is very shear. The shawl is very simple. It is a very long and wide. Looks to be a full width of fabric wide. Guess that it is 45" long but since it is crocheted fabric width would not matter. If on her shoulders, the shawl would fall to almost knee level. The width is twice that. The top edge very fine. The diagonal edges look to have some kind of a pattern on them. Since this is crocheted, it is assumed the edges are not turned under. The DVD description does say "hooded", but there is zero evidence of this. There are a few mis-statements in the commentary. Could this be one of them. Did she mean that the shall was wrapped around like a hood? The dress consists of two full length layers. It is unknown if they are attached. However, we know for certain that the Rose Dress is two layers so it is likely that this is two separate garments. She wore wide palazzo trousers, wide enough to appear to be a skirt. She would probably be wearing white leggings with the high white boots. The under dress is a silvery metallic silk that has been broomstick/crinkle pleated. There are no center or princess seams in front. This fabric is quite stretchy so will shape itself and mold to the body fairly easily. The neck is lightly scooped and not visible beneath the over dress. The long sleeves bell out widely. However, they are not nearly as elaborate as her other sleeves will get. The sleeves are fingertip length and look to be finished with either a serged hem, stretched to widen out the sleeve or it's actually turned under to hem because of how it ripples. The outer dress is a full length, round neck dress. The scoop is not very deep and is not decorated. In most shots the neckline is obscured by the halo cloak. The fabric is white wool woven with a silvery metal. It gives the feeling of lightness, but apparently not enough in the close ups.. It is 4 parts with no darts. It is assumed there is a zipper in the back. The front is joined from top of the neckline to below the end of the bust. The fabric pulls tight across the bust, shaping the dress. This line is accented in a beaded piping which runs from neckline down to the ground on both sides of the open outer dress. There does not appear to be any train, but we do not see the dress enough to know for sure. However, it is probably longer on the sides and back, but we're guessing. The outer dress's sleeves are unique. They are a one part wrap around, It is stitched closed from front shoulder to about 2 inches above the elbow bend. The sleeves descend almost to her knees. The beaded piping goes from the front shoulder down both sides of the split. The bottom edge looks to be square cut and edged also... but we do not get a clear view of this. Narrow silver and circlet worn just above the brow. Point is down in center. It looks to be very 3-D, rather thick. Gets buried under her hair so cannot tell if it goes all the way around. Her hair is parted in the center. The dress is worn by itself and consists of two full length layers. It is unknown if they are attached. However, we know for certain that the Rose Dress is two layers so it is likely that this is two separate garments. The under dress is a silverery metallic silk that has been broomstick/crinkle pleated. There are no center or princess seams. This fabric is quite stretchy so will shape itself and mold to the body fairly easily. The neck is scooped and not visible beneath the over dress. The sleeves would need to be set in. The long sleeves are rather narrow. Their width is no wider than what we seen on the Chase Dress. The sleeves are fingertip length and look to be finished with a narrow zig-zig hem. The edge has not been stretched out like on the halo underdress. We see no sign of any slits in the under dress. Given this fabric, the under dress is most likely just a tube, seams on the sides, almost all the fitting handed by the stretch in the fabric. If she takes only small elven steps, the side could be stitched all the way down, though for movement's sake it may be open from the knee down. The edge of the hem is probably finished in the same way as the sleeve, the narrow zig-zag. The outer dress is a full length, scooped neck dress. The scoop is deep but is not as wide as we will see on many of her other dresses. The fabric looks to be a mid-weight synthetic white and metallic silver mix knit. There is a tad bit of stretch in the fabric. It is 4 parts with no darts. There is a invisible zipper in the back. The front is joined from top of the neckline to below the center of the bust line. The fabric pulls tight across the bust shaping the dress. This line is accented in a beaded piping which runs from neckline down to the ground on both sides of the open outer dress. The back of the dress is split for riding. Unknown if the piping is in the back... However, based on when the dress was created (fairly early), they probably didn't spend the money on it. The dress does not have a normal train. It is the same length all the way around, about 3 feet longer than the ground. The edge is turned under with a narrow hem. The costume reference photos show how the fabric has been stressed and stretched out. The outer dresses low, scooped neckline is decorated with 2-3” wide trim. The neckline trim is very ornate and 3-dimential and glittery. The ornate, glittery medallions look like they're mounted on a white net with white scalloped edges. The neck edge of gown has the same row of silver bugle bead piping as the front and sleeve seams. The outer dress's sleeves are unique. They are set in. They are a one part wrap around, It is stitched closed from front shoulder to about 2 inches above the elbow bend. The sleeves descend almost to her knees. The beaded piping goes from the front shoulder down both sides of the split. The bottom edge looks to be square cut and edged also... but we do not get a clear view of this. 3/4 shot, dark, shawl a bit more defined, draping down her back. Can see little of the dress detail, but can see the fuzziness of the cloak fabric and the crown low on her brow. No sleeves, but can really see the main fabric and trim. note how stretching and shear even two layers are - it fits a larger model than liv, and the undies show. Check our Halloween Page for links. This dress is very form fitting and unforgiving. Wear a shaper underneath. Elves are NOT lumpy. You don't have to be as skinny as a broom stick to wear this, but you do need to smooth out and control the jiggle. Use a pattern for knits, the neck, bust and sleeve will fit better. The metallic broomstick pleated fabric of the underdress is very shear. You probably should line the dress either in a plain white crinkle or make a straight slip with slits on the side. Make sure the outer dress fabric you select is stretchable enough. If you have a large bust/waist difference, you may wish to close the dress to the under bust point so the fabric will help shape you... else it will hang off your bust line, and add many pounds to your look. The under dress has two options for you..
Just make a stretch tube with long sleeves. You may wish to leave the sides open from the knee down.... because you don't walk like an elf... and the alternative is ripping your dress. If you want the ridding option, you need to find a pajama style jump suit pattern and move the opening from the front to the back. (Look for a vintage 60's-70's pattern) Widen out the legs so you're using full widths. Be aware that the seams of the underdress are going to be itchy, you may want to bind the seams to protect your underarms. Do not try to do French seams. This crinkle fabric will laugh at you if you try. They have a beaded edge trim. Enter this number: 00729 there and click on "Find". The trim will be found, choose "silver"
Trim is just under $10 a yard. If you have time the trim could be made. Each loop is 10 seed bead and one silver bugle bead across the bottom. The outer dress fabric could be any stretchy knit with a bit of a pebbly surface. If you're lucky you will find one with metallic threads. DO NOT try to make this in non stretch fabric. The trim can be one solid fancy piece or made up of beaded, pearled and sequined medallions.